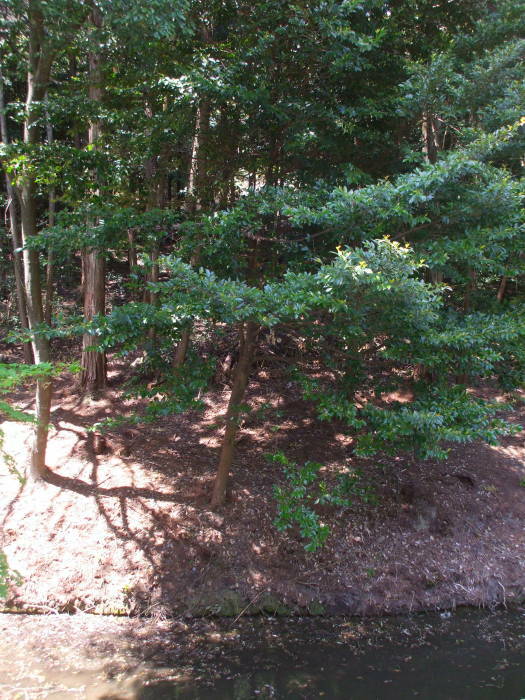 This kofun is also in that tight cluster, just north of the vague kofun of Empress Kōken / Shōtoku, and nestled like spoons with the kofun of Empress Hibasuhime-no-mikoto. 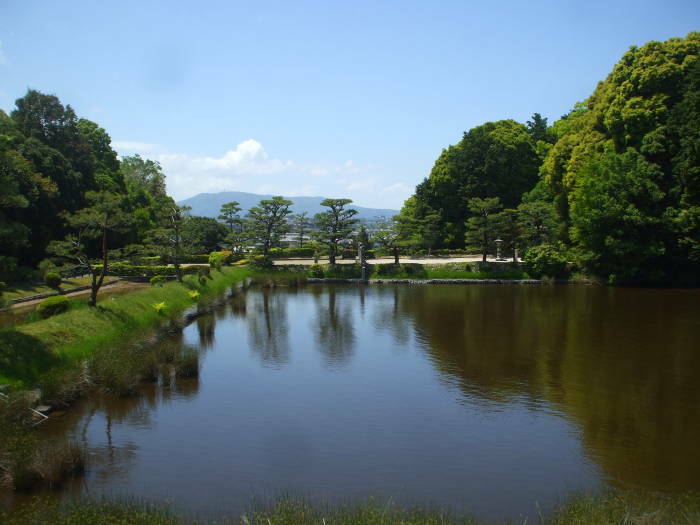 Below is a view along the moat around the top of the kofun, from the northeast quadrant. 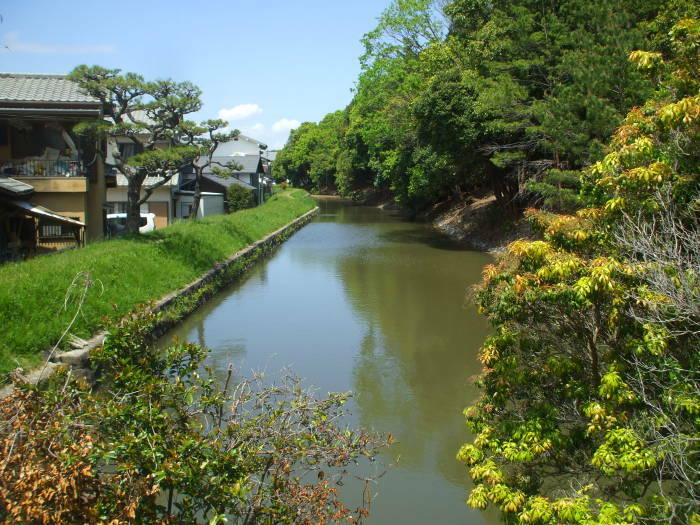 In the pictures above and below I'm walking south along the narrow lane separating the moat of the kofun of Empress Hibasuhime-no-mikoto, at left, from the moat of the kofun of Emperor Seimu, at right. 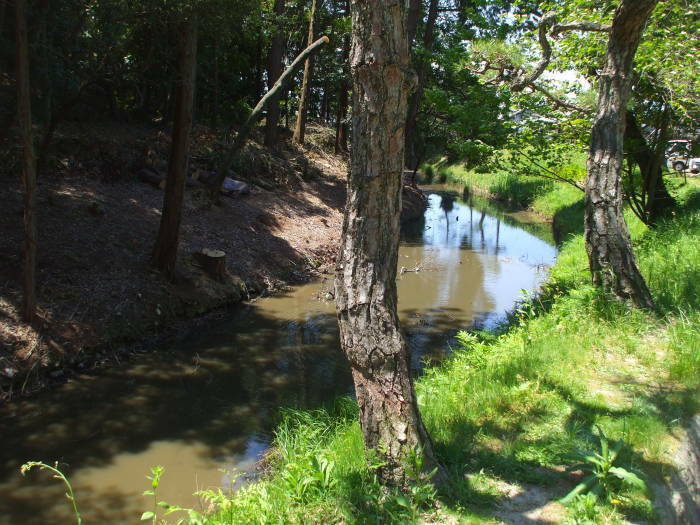 The broad moat across the bottom end of the kofun is sharply squared off. 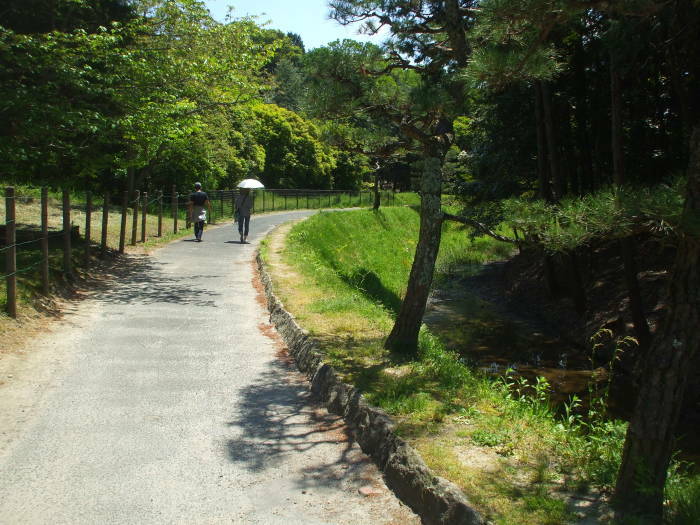 The area for visiting or viewing forms a bridge to the kofun. This is very different from the others I have seen. A small garden-like area is the outermost fenced-off area. In the picture above I'm looking over the outermost tamagaki or fence. 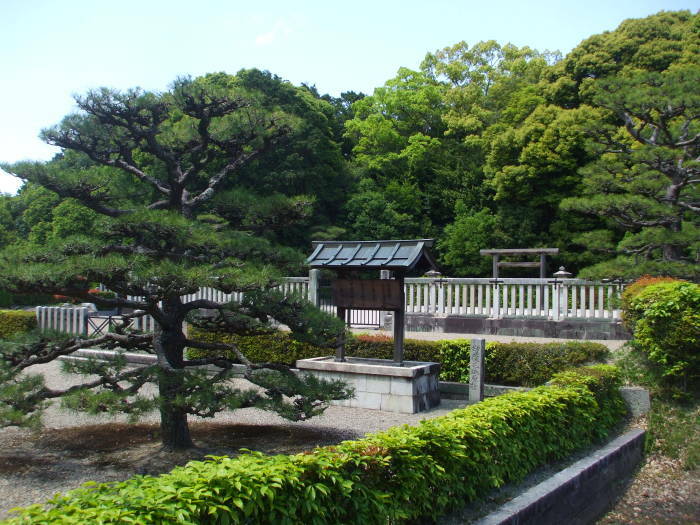 Three areas of raked gravel and two more fences lay between me and the torii. 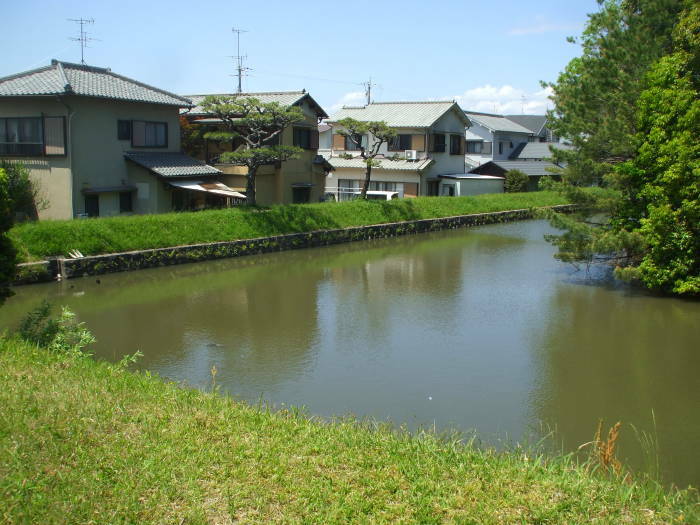 The neighbors have a kofun moat dike as their back yard. This kofun was looted multiple times. Records from those incidents indicate that there was a rectangular stone tomb chamber containing a stone coffin under the center of the circular section. 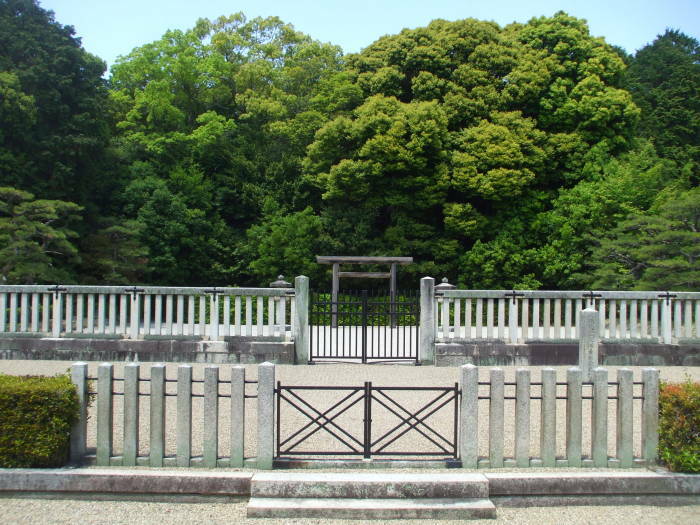 According to the Japanese Wikipedia page, which Google translation has referring to this as both Saki Ishizuka and Sasazuka Yamako-shu burial mound, "Also, it seems that mirrors, balls, swords and the like were robbed, but details are unknown." 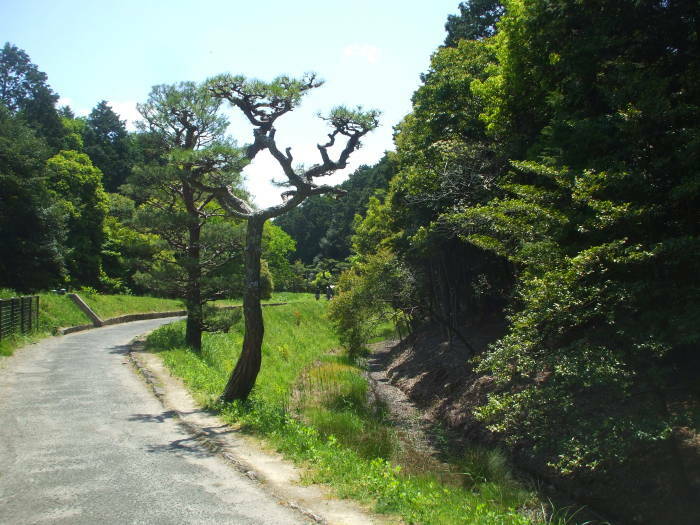 This kofun was looted in 1063. 16 people were implicated in the robbery, all were exiled. Then in 1844 and 1848, it was looted twice more. 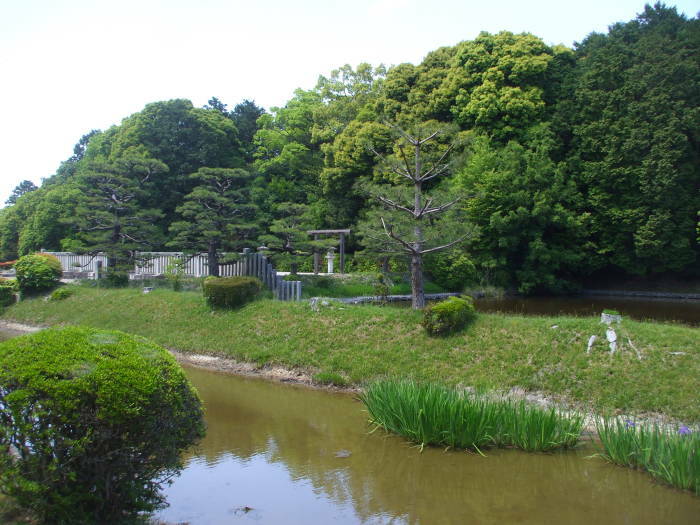 About five other kofun were looted around the same time. 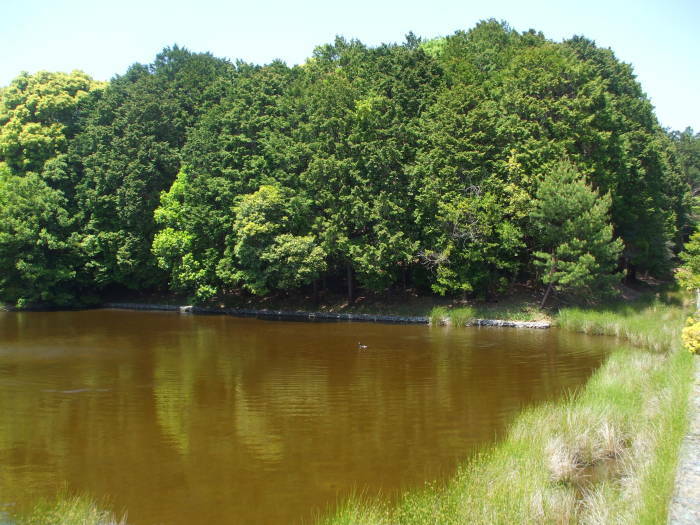 Twelve people were caught in this area. Four who were considered masterminds of this kofun-looting gang were executed in prison, their bodies were salted and hauled around Nara to warn anyone else against such a plan, and then for good measure their bodies were crucified. This was toward the end of the Shōgunate, when the Imperial cult wasn't very powerful. Who knows what would happen when the Emperor was truly in power. Emperor Seimu, also known as Wakatarashihiko no Sumeramikoto, ruled from 131 to 191 as the 13th Emperor of Japan. He is credited with appointing the first provincial governors and district officials. Historians regard Seimu as a legendary Emperor who might be real. Very little is recorded about Seimu. Emperor Kinmei, the 29th Emperor (about 509 to 571), is the first Emperor for which verifiable dates are known. If Emperor Seimu actually existed, he wouldn't have been named Seimu. That name was assigned posthumously. Also, he wouldn't have used the title tennō or Emperor, as that title used until Emperor Tenmu, the 40th ruler, who ruled 631–686. Seimu, if he existed, would have been a chieftain or local clan leader, ruling over just a small portion of modern-day Japan. Finally, Seimu is said to have ruled in the 100s, but this kofun is thought to have been built about two centuries later.